The Northeast terminal devoted to bulk material distribution and warehousing. Known for years of cooperation in the global market. McKees Rocks Industrial Enterprises, Inc. (MRIE) serves as both an industrial park and terminal facility, and has been in the material handling business for over 30 years. MRIE offers complete intermodal transloading and storage services for steel products, scrap, dry bulk and a variety of other commodities. In addition, MRIE is outfitted to handle all of your value-added processing needs. 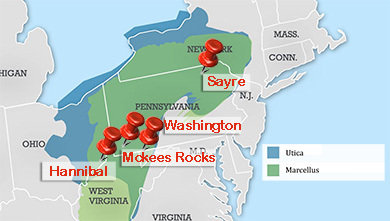 We store, process, blend, bag, screen, dry and distribute bulk materials, coal, steel products and packed goods throughout Northeast, Mid-Atlantic and Canada. At MRIE we are committed to serving our customer's diverse material handling requirements by providing seamless execution from start to finish. Our complete intermodal transloading facility allows us to serve all of your bulk material storage and distribution needs. Our facility is equipped to receive and handle both inbound and outbound materials via barge, rail or truck. The history surrounding MRIE, a dynamic bulk materials handling and warehousing distribution company located just outside of downtown Pittsburgh, PA, is one that is rooted in humble beginnings. MRIE was founded in the early 1960's by two prominent real estate attorneys, subsequent to their purchase of the Pressed Steel Car Company site, an expansive and strategically located, 85 acre site, situated at mile point four (4) on the Ohio River. This period of time also offered new opportunities for market expansion, service diversification and company growth. Accordingly, the partnership's focus on the company as a real estate related venture, switched focus on establishing MRIE as a bulk materials handling and warehousing operation. Successful capitalization on niche opportunities within the bulk materials handling and warehousing industry, has both contributed to our success in establishing an industry name, and has also enabled us to differentiate ourselves from competitors given our strong emphasis on customer service and long lasting customer relationships.